It was a great day to celebrate American resilience and honor heroes. It was a great day to act instead of watching. It was the type of day I will always remember. On the tenth anniversary of 9/11, scouts converged on Gwinnett Fire Station 24 in order to thank and honor our local heroes and to honor the sacrifice of the 343 firemen and paramedics who died at the site of the Twin Towers ten years earlier. It began as an idea and ended in action. While Pack 503 had already planned an impactful ceremony, as part of Scout Surge, Den 7 decided to supplement the efforts by honoring some local firefighters on their “home turf.” We wanted to make sure that those who were on duty had the opportunity to be thanked for all they do and to remember the fallen firefighters and paramedics. Boy Scouts from Troop 503 came to honor the firefighters, creating a Color Guard which served with honor and distinction. Girl Scout Troops 1153 and 3628 arrived in force, bearing handmade cards for the firemen. Their action inspired our Cub Scouts to arrive with handmade cards, as well. 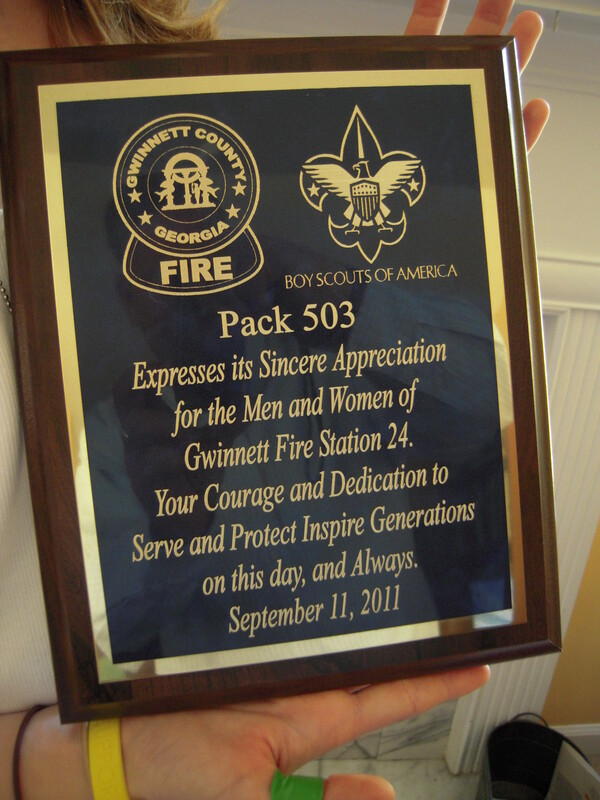 We honored the local firefighters with a plaque of appreciation and cards. And the mother of one of our scouts went the extra mile to ensure that all of the firefighters received a nice meal from Ramano’s Macaroni Grill. We were told that the restaurant responded in the affirmative, without pause. We honored the fallen by reading the 343 names, as the flag was retired. Each of the first responders left behind loved ones in the line of duty. It was necessary for us to hear each name and acknowledge each hero. It was a great day to be doing something somewhere. It was a great day to express gratitude and to honor fallen heroes. It was a great day to be a father and a den leader. It was a great day to be an American.